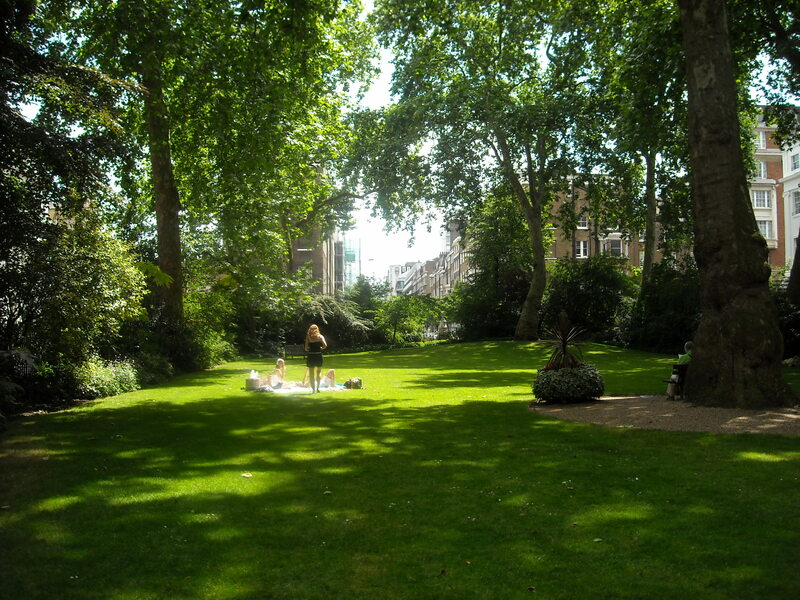 Montagu Square is the only purely residential square left in Westminster and has a narrow oblong garden. Developed for the Portman Estate, Montagu Square was designed by Joseph Parkinson, District Surveyor of Westminster, as a twin for Bryanston Square. It is named after Mrs Elizabeth Montagu of Portman Square. The houses were built from 1811 but the garden was laid out in c.1800. Famous residents include Anthony Trollope, who lived in No 39 from 1873-1880. In 1999 the residents restored the railings, which had been removed during WWII. LBII: east side 1- 5, 6, 7 -12, 13- 17, 18, 19, 20-22, 23, 24-26; north side no. 30; west side 33 & 34, 35, 36, 37-39, 40, 41, 42 & 43, 44, 45, 46, 47-49, 50-51, 52-59, 60 & 61- 63; cast iron water pump in garden opposite of no. 15. Has opened for OGSW. Otherwise private, for key holders only. Tube: Baker Street (Bakerloo, Hammersmith & City, Circle, Metropolitan, Jubilee), Marble Arch (Central). Bus: 2, 13, 30, 74, 82, 139, 159, 274. Montagu Square is the only purely residential square left in Westminster and has a beautiful and tranquil garden of narrow oblong shape. The land was within the Portman Estate, and Montagu Square was designed by Joseph Parkinson, District Surveyor of Westminster, as a twin for Bryanston Square, and built from 1811 by David Porter. The two squares are the chief compositions of the estate between Gloucester Place and Edgware Road (Pevsner). Montagu Square was named after Mrs Elizabeth Montagu, the rear of whose house on the north-west corner of Portman Square formed the southern closure of the new square. While the houses were not begun until 1811, the gardens appear to have been established several years earlier, soon after 1800. In 1808 there was an application by the parish to the vestry for lamps to be placed around `such parts of the garden as are now paved', and in 1811, an early lease for No.14 charges the tenant for `sowing, mowing, gravelling and painting and keeping up the garden... and painting the iron railings and lighting the lamps'. Maintenance of the communal garden, the freehold of which remained with the Portman family, was vested in a Trust set up by an Act of Parliament in 1813. The Trust levied a rate to pay for the garden upkeep on the occupiers of the houses in Montagu Square. In 1928 the garden is described as 'a long narrow enclosure surrounded by a thick shrubbery', 'laid out as lawns, with some fine trees'. Charles Knight in 1844 mocks the two squares as `twin deformities', but in fact they are not a pair. The facades are different: the houses in Montagu Square have a shallow bay window carried up polygonally - they were sourly ridiculed by Knight as being `constructed in the most approved Brighton fashion, each with its little bulging protuberance, to admit a peep into neighbours parlours'. The gardens too are different: distinctive egg-timer `waist', now unfortunately looking like parking bays. The buildings in Montagu Square are less altered, but the garden is less interesting, although possibly more carefully maintained. The path layout is a straightforward perimeter walk as it appears always to have been. An early watercolour plan in the Portman estate archives shows the waist densely planted with a circular path feature, now replaced by a box hedge and sundial. The trees are less imposing than those in Bryanston; there are also modern flower beds or strips. The boundary is contained partly by modern, post 1961, railings, and partly by wire mesh fencing and a privet hedge. The square contains two buildings: at the northern end a recent wooden shelter, and at the southern end a brick building, also recent, with beds in front, contained by modern brick piers and a wrought iron gate. A cast iron waterpump in the garden opposite of no. 15 dates from the early 19c. and is designed in the form of a Doric column (the same one is to be seen in Bryanston SquareI). Famous residents include Anthony Trollope, who lived in No 39 from 1873-1880. In 1999 the residents restored the railings which had been removed during WWII.